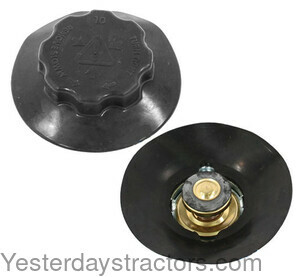 This 10 pound radiator cap with cover is used on multiple tractors. It replaces original part numbers 527425R1, 532672R91, 532029R1, 532029R2, 3118639R1, 1500626C91. New, aftermarket Radiator Cap for sale with a solid manufacturer warranty. In addition, we have a generous 30-day return policy if this Farmall Radiator Cap for Farmall 2400A.2500A, Hydro 100, Hydro 186, 1066, 1086, 1466, 1468, 1486, 1566, 1568, 1586, 258, 268, 278, 3220, 3230, 385, 4210, 4230, 4240, 454, 464, 474, 475, 484, 485, 574, 584, 585, 674, 685, 766, 784, 785, 786, 884, 885, 886, 966, 986 tractors needs to be returned for any reason. Please see our Parts Warranty and Return Policy links on your left for complete details before returning.